I have only good things to say about this product. It helped me get rid of all the gastrointestinal worms in my cat. Great price and free shipping! What else can you ask for? Thank you Mediworm! 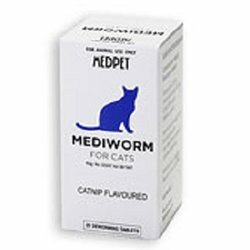 great product, I only use mediworm, easy to give to the cats by mixing it in tuna, just to ease the pill down the cats throat, all over in seconds, less stress on the cat and me. I have used this product before and it is very effective.